Warren County is a county in the U.S. state of New York. It is part of the Glens Falls, New York, Metropolitan Statistical Area. As of the 2010 census, the population was 65,707. It is named in honor of General Joseph Warren, an American Revolutionary War hero of the Battle of Bunker Hill. The county seat is Queensbury. 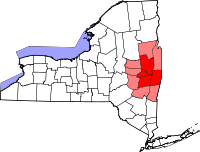 When counties were established in New York State in 1683, the present Warren County was part of Albany County. The county was enormous, covering the northern part of New York State, all of the present State of Vermont, and, in theory, extended westward to the Pacific Ocean. It was reduced in size on July 3, 1766 by the creation of Cumberland County, and further on March 16, 1770 by the creation of Gloucester County, both containing territory now in Vermont. On March 12, 1772, what was left of Albany County was split into three parts, one remaining under the name Albany County. One of the other pieces, Charlotte County (named for Charlotte of Mecklenburg-Strelitz, queen-consort of King George the Third of England), contained the eastern portion. In 1963, the courthouse in Lake George village was closed and operations moved several miles south to its present day location at the Warren County Municipal Center main campus in Queensbury. According to the U.S. Census Bureau, the county has a total area of 932 square miles (2,410 km2), of which 869 square miles (2,250 km2) consists of land and 62 square miles (160 km2) (6.69%) consists of water. Warren County is situated in the eastern portion of New York state; the eastern border is Washington County. Being located in the Adirondack Mountains, it is not uncommon for mountain peaks to surpass 2,000 feet (610 m). The highest peak in the county is Gore Mountain at an elevation of 3,198 feet (975 m). The climate of Warren County is humid continental, as is most of New York State. In the winter, bouts of cold, dry air arrive from Canada, and interior sections of North America. In the summer, the Gulf Stream can bring days of hot, moist, humid air to the county. Extratropical storms often affect the county; in the winter, Nor'easters bring heavy snow and rain, and sometimes high wind. Fall and spring are generally relatively mild and pleasant, with fall foliage regarded as some of the most stunning in the country. In the summer and fall, back door cold fronts move in from the north and bring thunderstorms, sometimes severe. In the county the population was spread out with 24.00% under the age of 18, 7.50% from 18 to 24, 28.20% from 25 to 44, 25.10% from 45 to 64, and 15.20% who were 65 years of age or older. The median age was 39 years. For every 100 females there were 94.20 males. For every 100 females age 18 and over, there were 91.00 males. Warren County has 20 county supervisors; Ronald F. Conover; Frederick H. Monroe; Daniel J. Girard; Peter V. McDevitt; Harold (Bud) Taylor; William Loeb; William H. Kenny; Daniel D. Belden; Ralph W. Bentley; Sterling Goodspeed; Frank McCoy; Eugene J. Merlino; David J. Strainer; Fred Champagne; William T. VanNess; Matthew D. Sokol; Daniel G. Stec; Frank E. Thomas; Evelyn Wood; and Kevin Geraghty,  which represent 11 of the county's towns. There are also 11 town supervisors. There are several state and county maintained roads in Warren County, making up a total of 1,246 miles (2,005 km) of roadway. The only U.S. Route is U.S. Route 9, which traverses the eastern portion of the county. The only interstate is Interstate 87, also known as the Adirondack Northway. Warren County is home to several music centers, including the Luzerne Music Center, which is a summer camp focused on teaching music, in the foothills of the Adirondacks. In July, it holds an annual Chamber Music Festival which is open for public viewing. The Upper Hudson Musical Arts is also a popular attraction, bringing concerts by professional chamber music ensembles and soloists to the Adirondacks throughout the year. Concerts are held at the Tannery Pond Community Center in North Creek. In addition, the Charles R. Wood Theater home to Adirondack Theatre Festival is a year-round professional theater production in Glens Falls. Warren County is the primary area of tourism related to Lake George. Lake George is a 28,160-acre (113.96 km2) lake located in the Adirondack Mountains. Popular activities on the lake include river tubing, swimming, kayaking and boating. There are several large points of interest in the Lake George region. These include Prospect Mountain just outside of town, Steel Pier along Beach Road which serves several tour boats. The village is a popular tourist spot and is home to many stores and novelty shops. There is the Lake George Battleground on the edge of the village along County Route 6. ^ a b "The History of Warren County". Warren County Historical Society. http://www.warrencountyhistoricalsociety.org/history-of-warren-county/. Retrieved August 9, 2010. ^ "Find a County". National Association of Counties. http://www.naco.org/Counties/Pages/NACo_FindACounty.aspx. Retrieved August 9, 2010. ^ "Old Warren County Courthouse, Lake George Village, Warren County, Lake George NY 12845". The Gombach Group. http://www.livingplaces.com/NY/Warren_County/Lake_George_Village/Old_Warren_County_Courthouse.html. Retrieved August 9, 2010. ^ Parrott, Alex (June 13, 2005). "Lake George charm resides in its old buildings". The Post Star. http://poststar.com/opinion/commentary/article_9959722f-0f87-5384-acba-7eb899906f39.html. Retrieved August 9, 2010. ^ U.S. Cenusus Bureau (2000). "Warren County Quick Facts". http://quickfacts.census.gov/qfd/states/36/36113.html. Retrieved 2008-03-08. ^ USGS. "Gore Mountain topography map". http://www.topozone.com/map.asp?lon=-74.035134&lat=43.6764539&datum=nad83. Retrieved 2008-03-08. ^ a b c d Cornell Cooperative Extension (2007). "Climate of New York". Cornell Cooperative Extension. http://nysc.eas.cornell.edu/climate_of_ny.html. Retrieved 2008-01- 30. ^ Weather Channel (2008). "Warren County Averages". http://www.weather.com/outlook/homeandgarden/garden/wxclimatology/monthly/graph/USNY0771?from=36hr_bottomnav_garden. Retrieved 2008-03-08. ^ a b U.S. Census Bureau (2000). "Warren County Census". http://quickfacts.census.gov/qfd/states/36/36113.html. Retrieved 2008-03-07. ^ "Warren Count Board of Supervisors". Warren County Website. 2011. http://www.co.warren.ny.us/gov/bos.php. Retrieved 2011-08-19. ^ a b EDC. "Government of Warren County". http://www.edcwc.org/regional.htm#govt. Retrieved 2008-03-07. ^ a b "Warren County Town Mayors". Warren County Website. 2011. http://www.co.warren.ny.us/gov/. Retrieved 2011-08-17. ^ a b Warren County Sheriff's Office (2006). "Warren County Sheriff". http://sheriff.co.warren.ny.us/index.html. Retrieved 2008-03-07. ^ Lehman, Don (March 28, 2011). "State budget decision may save Warren County Sheriff’s Office boat patrols on Lake George". The Post Star. http://poststar.com/news/local/article_f130b13a-5975-11e0-9485-001cc4c03286.html. Retrieved March 30, 2011. ^ "Official Results General Election 11/04/2008". Warren County Board of Elections. 2008. http://www.co.warren.ny.us/boe/election/2008/g_cumul08.htm. Retrieved January 21, 2011. ^ 2005 Rand McNally Commercial Atlas & Marketing Guide (2003). "Warren County, New York". http://www.schenectadyhistory.org/local/rm_warr.html. Retrieved 2008-04-16. ^ a b c HRFM Law (2008). "Recent patents reflect vibrant medical-device activity in Tech Valley". http://www.hrfmlaw.com/img/articles/hrfmlaw-093005.pdf. Retrieved 2008-03-07. ^ a b c Public School Review. "Elementary schools in Warren County, New york". http://www.publicschoolreview.com/county_schools/stateid/NY/county/36113. Retrieved 2008-03-07. ^ Public School Review. "Queensbury Elementary School". http://www.publicschoolreview.com/school_ov/school_id/57703. Retrieved 2008-02-07. ^ Public School Review. "Abraham Wing School". http://www.publicschoolreview.com/school_ov/school_id/54407. Retrieved 2008-02-07. ^ Public School Review. "Queensbury Middle School". http://www.publicschoolreview.com/school_ov/school_id/57704. Retrieved 2008-02-07. ^ a b Public School Review. "Bolton Central School". http://www.publicschoolreview.com/school_ov/school_id/54614. Retrieved 2008-02-07. ^ Public School Review. "Queensbury Senior High School". http://www.publicschoolreview.com/school_ov/school_id/57705. Retrieved 2008-02-07. ^ Great Schools. "St. Mary's - St. Alphonsus Regional Catholic School". http://www.greatschools.net/cgi-bin/ny/private/4512. Retrieved 2008-02-07. ^ SUNY Plattsburgh. "Learn about SUNY Plattsburgh". http://www.plattsburgh.edu/about/. Retrieved 2008-02-07. ^ New York State Department of Health. "Glens Falls Hospital". http://hospitals.nyhealth.gov/browse_view.php?id=148. Retrieved 2008-03-07. ^ a b PublicTransportation.org. "Transit systems in New York". http://www.publictransportation.org/systems/state.asp?state=NY#A62. Retrieved 2008-04-02. ^ NYSDOT (2006). "Warren County roadway mileage". New York State Department of Transportation. https://www.nysdot.gov/divisions/engineering/technical-services/hds-respository/warren.pdf. Retrieved 2008-04-02. ^ a b c d e f g NYSDOT (2006). "2006 Traffic report data". New York State Department of Transportation. https://www.nysdot.gov/divisions/engineering/technical-services/hds-respository/NYSDOT_Traffic_Data_Report_2006.pdf. Retrieved 2008-03-07. ^ a b c d e N. W. Perry. "Warren County Routes". Empire State Routes. http://www.empirestateroads.com/cr/crwarren.html. Retrieved 2008-03-07. ^ a b New York State Arts. "Warren County Arts". http://nystatearts.org/orgs/?county=Warren. Retrieved 2008-03-07. ^ Visit Lake George. "City of Glens Fall". http://www.visitlakegeorge.com/popDesc.cfm?db=links&id=52. Retrieved 2008-03-07. ^ Visit Lake George. "Warren County". http://www.visitlakegeorge.com/about.cfm. Retrieved 2008-03-07. ^ Trip advisor. "Prospect Mountain". http://www.tripadvisor.com/Attraction_Review-g48016-d116385-Reviews-Prospect_Mountain-Lake_George_New_York.html. Retrieved 2008-02-07. ^ a b Google Maps (2008). "Overview of Warren County Route 6". [Map]. http://maps.google.com/maps?hl=en&q=from:+Fort%20George%20Rd%20@43.417991,%20-73.707033+to:+Fort%20George%20Rd%20@43.411383,%20-73.711101. Retrieved 2008-03-07. ^ a b Lake George Vacations. "Lake Geogre Camping". http://www.lakegeorge-vacations.com/lake_george_island_camping.htm. Retrieved 2008-03-07. ^ a b NRHP. "Historic sites in Warren County". http://www.nationalregisterofhistoricplaces.com/NY/Warren/state.html. Retrieved 2008-03-07. This page uses content from the English language Wikipedia. The original content was at Warren County, New York. The list of authors can be seen in the page history. As with this Familypedia wiki, the content of Wikipedia is available under the Creative Commons License.